UNIQUE IT IS, WITH SOARING VOICES and imaginative performances. 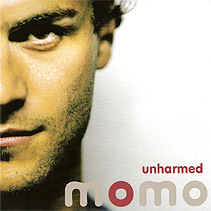 A tantalising mix of electronica, pop and classic music that tugs at the heartstrings, Unharmed is amazingly matured for a debut album from Momo  a diverse assembly of gifted singers whose signature sound has been compared to the best mix of Hans Zimmer, Craig Armstrong, Moby, Massive Attack, Air and Nitin Sawhney. Haunting strains of undulating chords lure you deeper into the tracks as you lose yourself in the magic of harmonising voices and instrum-ents. Unbelievable vocals leave you breathless and notes are drawn out so perfectly that you are lulled into a floating sensation of well-being. Momo is the brainchild of hot Spanish talent Toni Castells and features the voices of jazz singer Gracie Patton, triple-Platinum selling Spanish pop star Beth, Kiwi soprano Amelia Whiteman, and Irish singer-song-writer (and former Sharon Osbourne protégé) Roberta Howett. The Publicity Machine says: "Once in a generation an artist stands out so clearly as a star of the future, and Tony Castells is that artist. With his individual production, lyrical vocals and sonic vision, Toni provides his audience with a unique and stunning musical experience." Classically trained as a guitarist from the age of five, at just 13 Tony Castells won the prestigious III Young Composers Award. With a strong passion for popular music, he was driven to form his first band  Herzia  at twelve. Their debut album received unanimous critical acclaim in 1999. It was not long before Toni was carving out his career in popular music by producing and engineering multi-platinum international artists at hit-making Musician Studios. as Placido Domingo and pop legend Jose Maria Cano.  A momentous experience; innovative and comprising of quirkily different or classically-inspired gems, Unharmed is out now.